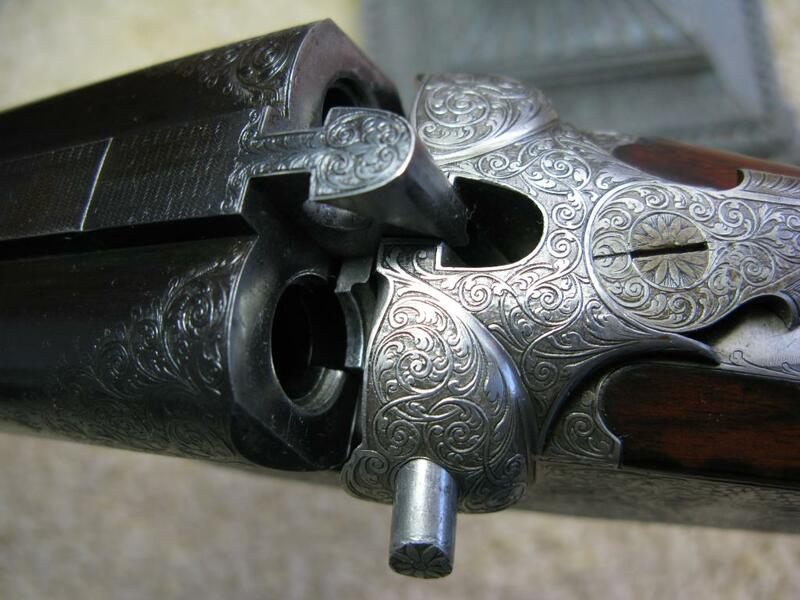 *MANTON SIDEPLATED BOXLOCK EJECTOR DOUBLE RIFLE. SN 307xx. Cal. .405 Winchester. 26 in. ; Chopper lump bbls with full length matted rib, have one standing, two folding leaf express rear sight dovetailed through. Bronze bead front sight has flip-up porcelain night bead, and is longitudinally dovetailed into raised portion of rib. Top of bbls are engraved “Manton & Co. Gun Makers.” and “Calcutta & Delhi”. There are 1-1/2 in; triangles of nicely cut scroll on breech ends. 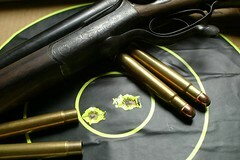 Bbl flats are stamped with 1925 German proofs and London nitro proofs for .405 Winchester. Sideplated boxlock action features crossbolted, square shouldered dolls head third fastener, side clips, reinforcing bolsters, bushed strikers, double triggers (front articulated), and automatic safety. Action is engraved with nearly full coverage, exceptionally well executed, large open scrolled acanthus with finely stippled background having central "Kalasha" urnmotif on each lockplate. Fences and top of action have same scroll, more deeply cut. 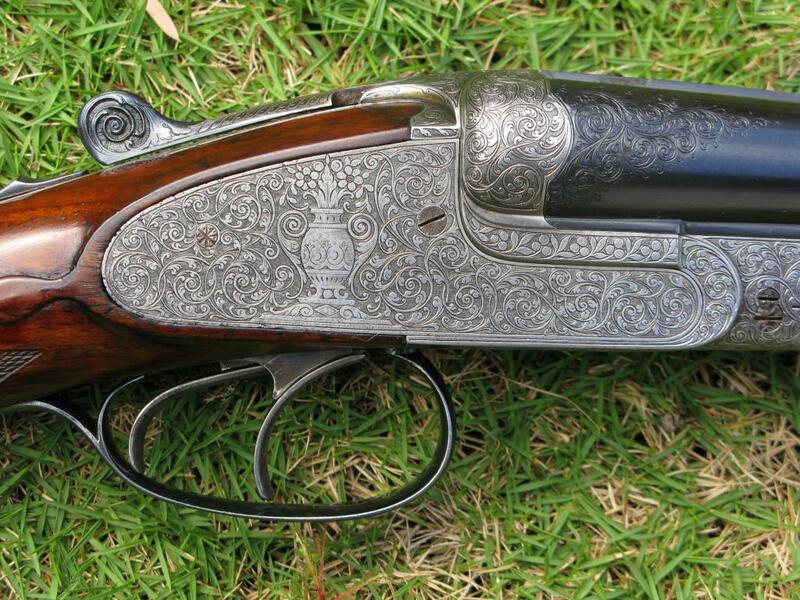 The urn motif continues onto trigger plate. 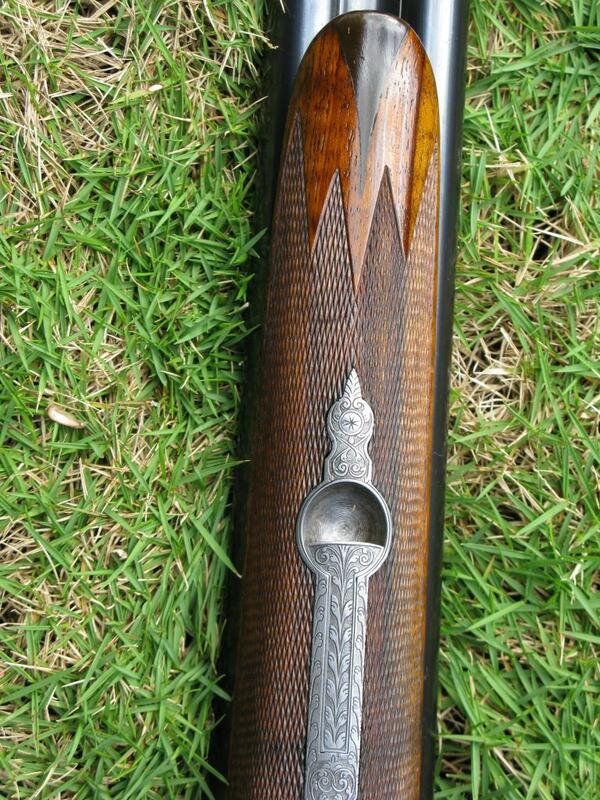 Scroll engraved trigger guard with SN at grip extends to horn cap. Nicely marbled and lightly figured European walnut full pistol grip buttstock measures 14-3/8 in; over Silver type pad, and features right hand cheekpiece, drop points, and point pattern borderless checkering. Long splinter ejector forend has inlet horn tip and Deeley release. Drop at heel: approx 2-3/4 in. ;, drop at comb: approx 1-15/16 in.;. Weight: 9 lbs. 4 oz, LOP 14-3/8 in;. CONDITION: Very fine. Bbls retain 90 – 95% satin blue. Action is coin finished. Stocks retain nearly all of a glossy oil finish with a few minor marks, sharp edges slightly rounded. Bores are excellent, bright and shiny, with strong, sharp rifling throughout. Action is tight. Bbls are on face. Ejectors are in time. A well made rifle, in an American caliber popular in India for tiger. Born on date of Nov., 1925. It regulates well with 300 grain Woodies. My B-Day present in August of 2014 with help from the wife. Relief engraving with darkened background. Points behind the locks. Locking screws on locking screws. Deely release with widow's peak forend. Doll's head and cross bolt. This just came back from servicing by J.J. in Oklahoma, clean bill of health. Flip up night sight, 1925 style. Looks a lot like Belgian or German make. 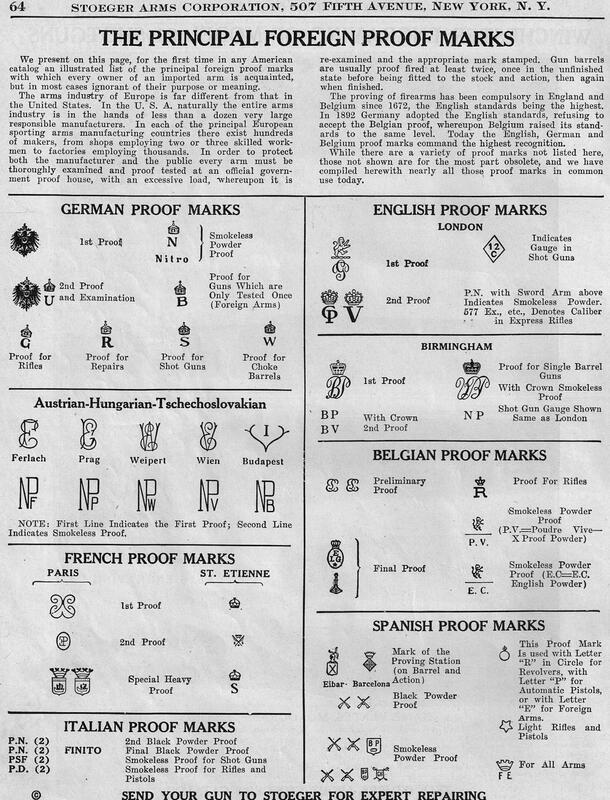 What are the proof- and other marks under Barrels like? Beautiful and in a great caliber too! I have always liked these Mantons with the urn engraving. IIRC, they were made by Francotte but not 100% sure. There was a recent article featuring one of these in the Doublegun & Singleshot Journal I will look up. Barrel flats. K.M.G. = Copper metal jacket bullet at 19 gr x 15.432 = 294 grain bullets. One can see the fine joint between the chopper lump barrels. Split ejector actuators. Correct me on the German proofs: Crown over N is the Nitro proof. Crown over U is the barrel exam . Crown over G is for rifled barrel and crown over R test after repair. 10 mm is the caliber. Arm and scepter over NP at 16.5 tons is the British nitro proofs of .405 x 2.58 case length. 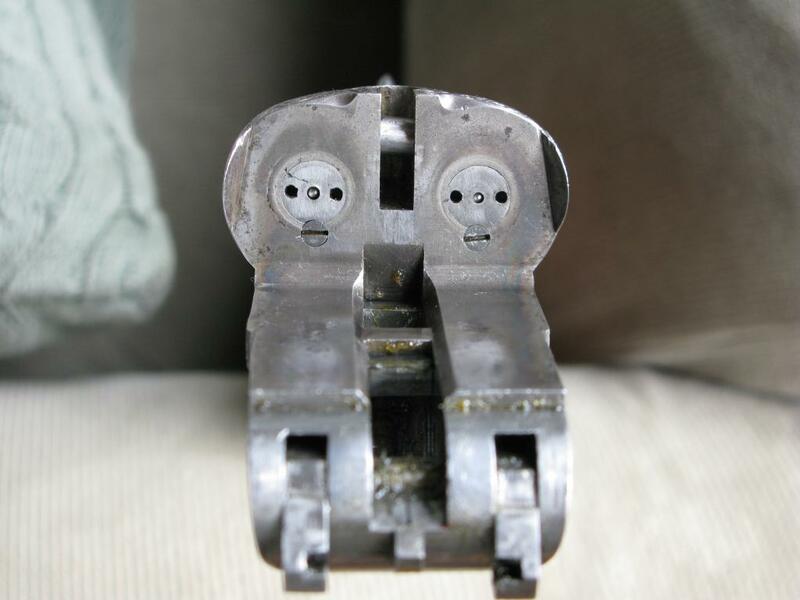 Breech face shows the bushed strikers and side clips. 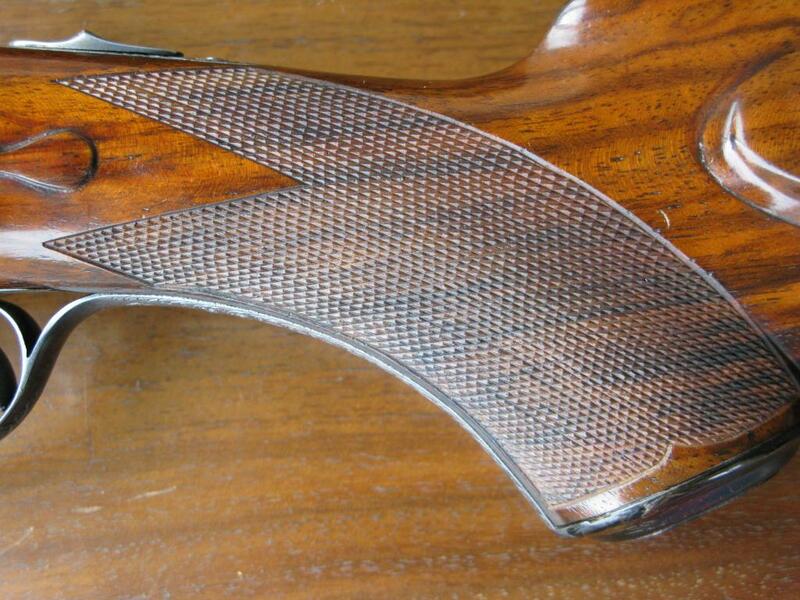 Here is a sample of the borderless checkering on the grip. Very little wear. I love that borderless checkering, never seen it before. 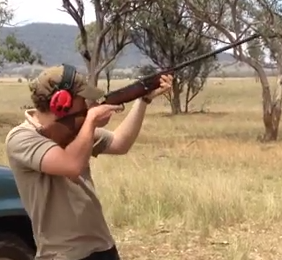 The rifle is obviously of German origin, made for Manton by the Suhl guntrade. 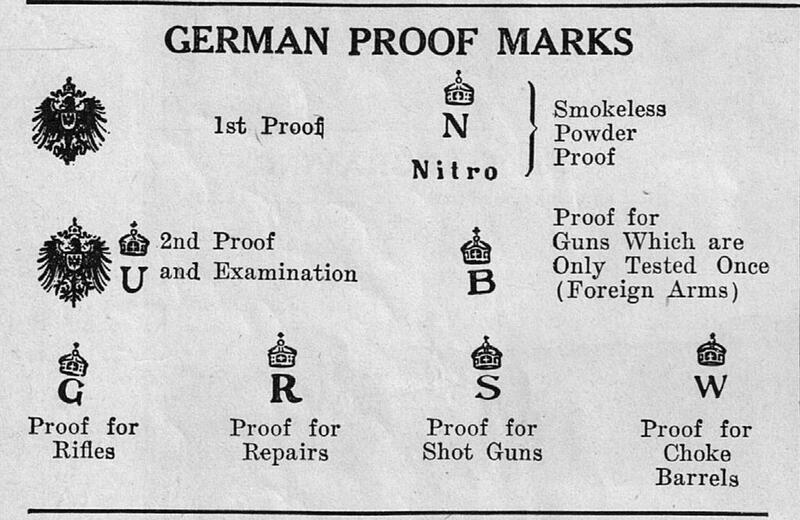 Before it was Nitro reprooved in London, as the German proof was not valid in the British empire, it was Nitro proofed in Suhl, 11/25 = November 1925. 10 mm was the bore/land diameter,65 mm the max case length. "Action is coin finished. Stocks retain nearly all of a glossy oil finish"
I am quite sure that originally, the action was color case hardened, though it looks "coin finished," due to long term friction and action from sunshine, effectively removing color from the case. The gloss on the stock, no doubt too, resulted from some past owner putting on some sort of varnish like finish, so the gloss isn't original either. The crown/R here is not the repair proofmark, as the crown is shaped differently and the R is in Ornate script. It is more likely a mark of the original maker or craftsman. I'll try to find out. 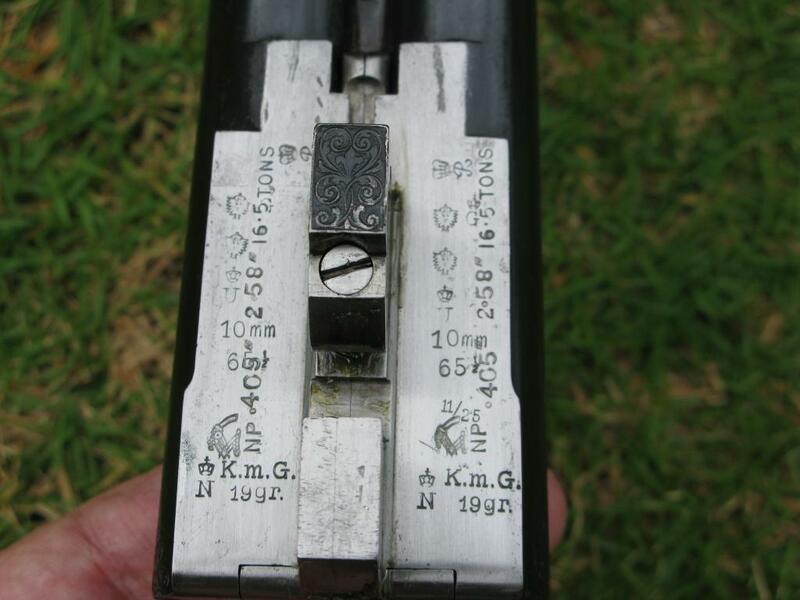 BTW, in the original proof law text,the crown/G mark does not stand for Gezogen = rifled, but for Geschoss = bullet. Smootbore ball guns also bear this mark. 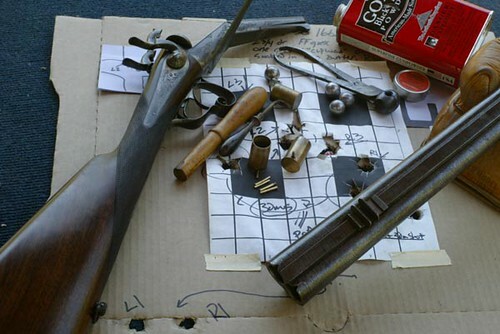 So do smoothbores chambered for the 9.1x40R Tesching cartridge, as this case was used as a "garden" shot cartridge, but was also availble as a rifle load. German foresters: We like sustainability! For merely 300 years by 2013. Thank you all for your thoughts on this piece, keep them coming. 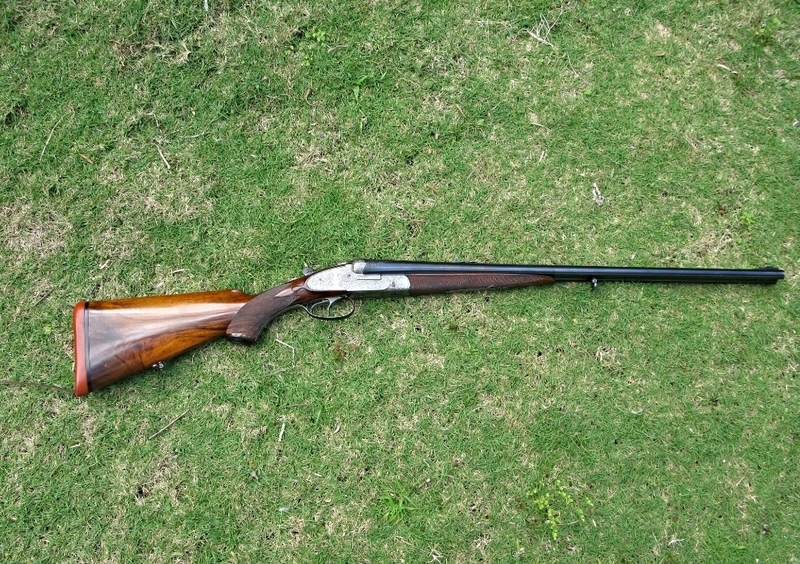 A beautiful rifle indeed and in a caliber that can be used on deer , tigers, cape buff, and ele. ! I recommend 400 grain Woodies for the latter. I agree that the action looks to have been made in Suhl or at least with much influence from Suhl. It has many similarities to the action of my Simson & Co Suhl except for cocking indicators. Can anyone comment from experience on the flip up front sight? 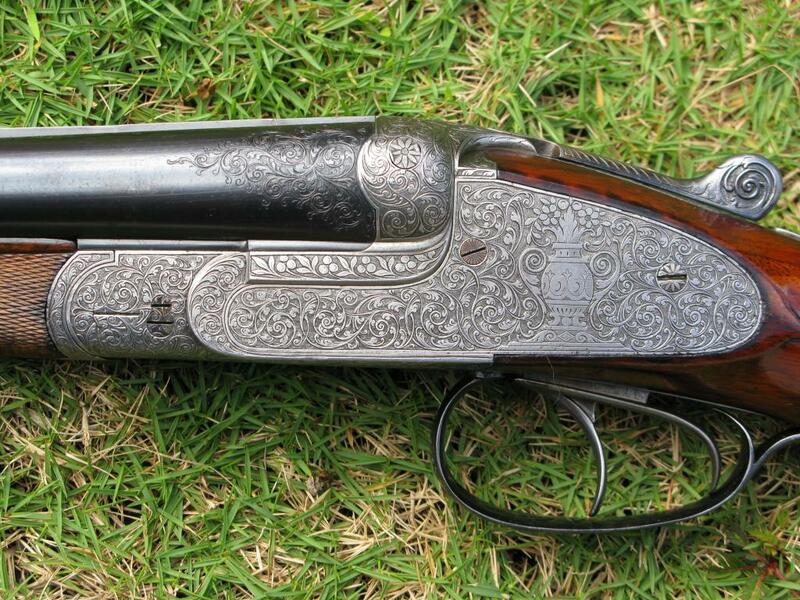 A beautiful example of workmanship to say the least. Bet all here wish that happened in their households! I have a brother that lives on a hilltop in Kaneohe (Mikiola Drive). The view from his picture window is of 'Gilligan's Island' (Cocoanut Island) and the Naval Air Station. Wow lovely rifle.Definitely a product of Schul marketed in India by Mantons. 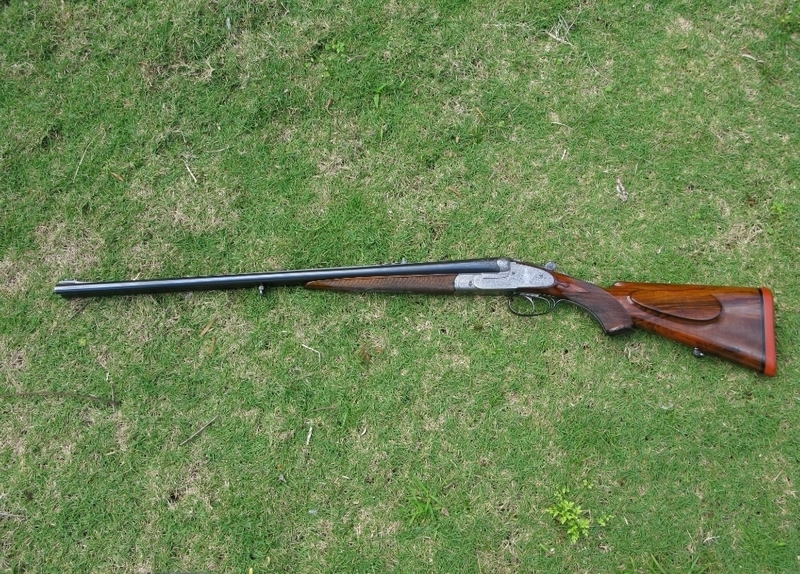 The 405 was popular in India more as a lever action round though some doubles were also sold. The famous hunter of Man eating Tigers Kenneth Anderson used a lever action 405. Incidentally German markings are based on a go, no go gauge. 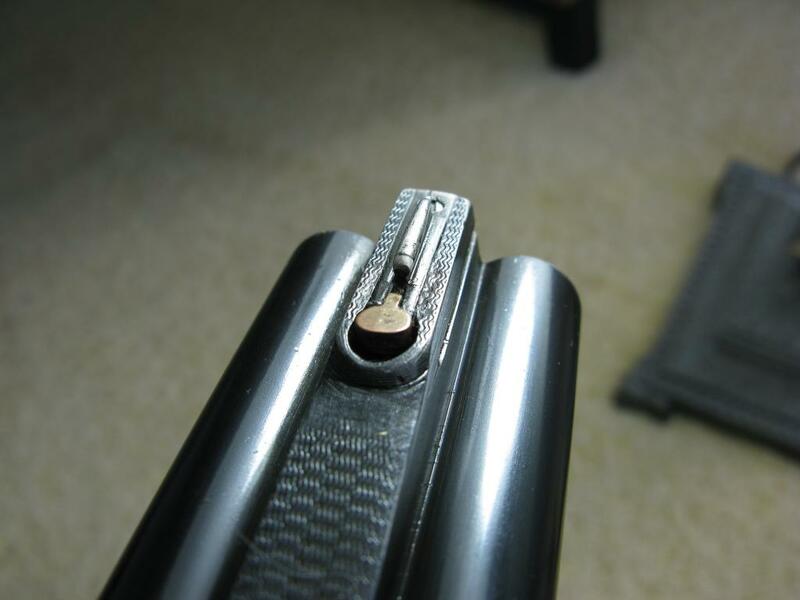 The 10mm is not the Groove/land diameter but the diameter of the largest gauge that would enter the barrel. Therefore the bore would be anything between 10 --10.1 mm plus the groove depth. Good point on Anderson. I have all his stories and can relate to the .405 since I have two 1895 lever action 405s and one Simson .405 double. The foresight looks viable, maybe 0.1”?